Despite the fact we’ve just returned from a vacation to the Virgin Islands, here at Jones central my children are most excited by the local convention, EvilleCon, which they’ve been attending for the last two days, one dressed as Maes Hughes (from Full Metal Alchemist), and the other as Aloise (from Black Butler). Apart from hanging out with friends and others who love the industry, I think they’ve both been most excited to chat with Vic Mignogna, who they’ve found warm, personable, and passionate about artistic pursuits. I happen to be a fan of Mignogna’s work myself — he gave voice to Edward Elric, my favorite character in the best anime I’ve yet watched, Full Metal Alchemist: Brotherhood, acquiring the American Anime Award for Best Actor in 2007 for his performance. But as if that wasn’t enough, he’s one of the guiding forces behind Star Trek Continues. Regular readers of the blog may recall the last time I blogged about Star Trek Continues and how much I enjoyed seeing what felt very much like a lost episode from the original series of my favorite show. (I likewise blogged about it over at Black Gate.) Well, when my son returned from EvilleCon last night he told me he’d seen part of another Star Trek Continues episode, “Lolani,” which was released in February. Somehow I had missed the release! It’s a lot easier for me to be generous about other genres than it used to be. I’m trying to decide if that has something to do with me mellowing with age, or if it’s because there’s a whole lot more sword-and-sorcery available than there was ten years ago … or if it’s simply that I don’t feel shut out anymore now that I’m writing sword-and-sorcery stories for a living. Fantasy seems a lot more popular even among the mainstream readers than it used to be, although the dividing line between fantasy and sword-and-sorcery still seems pretty blurry. I’ve spent a lot of time over the years trying to define the difference, but I often feel like I’m shouting in the wind. The common conception remains that if it’s got swords and magic, it must be sword-and-sorcery, regardless of pacing or the focus of the plot. But let’s set another discussion of sword-and-sorcery aside for the nonce and focus instead on genre prejudice. I think a lot of science fiction and fantasy writers and readers feel like low faces on the totem pole because their favorite fiction is sneered at by people in the know. A while ago, I started to realize that MOST writers felt like their genre was being kicked to the curb. Horror writers have been going through a hard time now for a good long while. YA writers, well, they “only write YA,” and God help the urban fantasy people, whom are in fashion to be hated. As writers and readers, we all turn up our noses at all the things we find wrong with some one else’s genre. Really, that’s all that’s happening with the literary criticism of genre work. It’s easy for us genre people to detail the things we find annoying about literary fiction, but it turns out lit fic writers feel harried themselves. 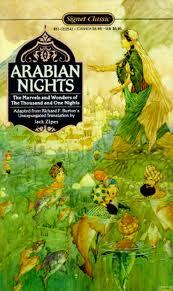 In a work as varied as The Arabian Nights there are naturally some portions more popular than others, probably because some are more easily adapted into standalone tales of adventure. I think we in the West are more familiar with the Nights as a concept than a whole, and many of us have only read or watched adaptions of the most famous of the tales. Don’t presume that means that the best of the stories have all been filmed and that there is no point reading the rest. There are plenty of excellent, lesser known yarns within, and surely part of the fun of reading the nights is watching the puzzle box interrelation of stories within stories within stories. Admittedly, there are some portions that I don’t like as well and don’t revisit, as with any short story anthology, and many people feel the same, although you’re likely to get a slightly different list of favorites from whomever you speak with. Today I want to draw attention to one of my favorite sections, “The Wily Dalilah and Her Daughter Zaynab.” If you’ve ever read my musings, you might expect this to be a tale of swashbuckling adventure set in distant locales, swimming with magic rings and djinn and evil wizards. “The Wily Dalilah,” though, is set only in Baghdad, and there is no magic to speak of within the entire story. There are no daring princes with swords, or mysteries, only a clever old woman running a series of con games. Over the course of the narrative, Dalilah, with occasional aid from Zaynab, foments so much trouble in Baghdad that she draws down the attention of the caliph himself. 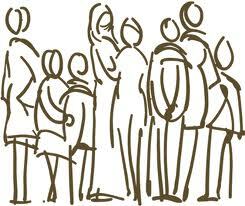 I spoke to some creative writing students at a local university a while ago and I tried to tell them something it took me a long time to understand: when you begin your writing career, you’re joining a community. By writing career, I mean your first published work. In my case, I was first printed in a ‘zine titled Gauntlet. Before I submitted my story to the magazine, about the only thing I knew about Gauntlet was that it was open to heroic fiction and sword-and-sorcery. I was making a common mistake — I didn’t know the market. It’s hard to know ALL the markets, especially when, in those bygone days of yore, to know about the magazine you had to buy an issue. (Most of those little magazines couldn’t be leafed through at local bookstores because they weren’t carried.) 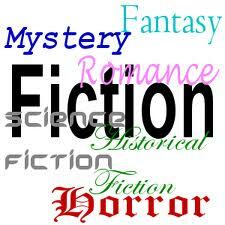 Today we submitters have it a little simpler because most magazines have web sites where fiction can be sampled. And, of course, an increasingly large number of magazines ARE e-zines. I think my favorite parts of Alexander the Great’s life involve his fight with the dragon, and the time he climbed to a mountain summit and saw the angel of death. Not to mention his conversation with the speaking tree. After that, his meeting with the Emperor of China was almost superfluous. I haven’t been dropping acid. I’ve been reading from the Shahnameh, the Persian Book of Kings, an epic poem and a national treasure of Iran, written by Abolqasem Ferdowsi over the course of many decades in the 9th century O.C.E. It purports to tell the history of Persia until the time of the Arab conquest, but what it mostly does is collect fabulous tales of adventure, betrayal, war, and love centered around Persian rulers. 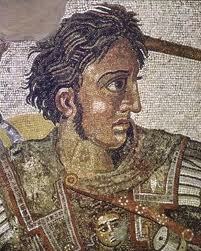 And because Alexander the Great came to rule Persia, there’s a long section devoted to him. Alexander the Great from history and Sekander from the Shannameh have very different lives, and the version told by Ferdowsi reads an awful lot like an abbreviated fantasy epic. Another Crossing the Streams contest has ended. I’ve chosen my favorite entry, randomly selected another, and sent all entries over to Ari Marmell, who will pull one at random so that one lucky person will get one free book from ALL of the authors in the contest. That grand prize winner will be announced next week some time. To enter my contest you had to name your favorite sword-and-sorcery/heroic fiction novel/story that has NOT been made into a movie, and explain why it should happen. Through those entries I read about a lot of work I’d never heard of, and I read about some suggestions I happento agree should long ago have been made into movies… although no one mentioned The Chronicles of Amber, which I personally feel should be converted into a trilogy as soon as possible. I can’t believe it hasn’t happened yet. Oh, if it does, can I PLEASE be involved in the script writing? Even if I’m just like the xerox boy? I’m back today, but mostly with links because there is much to be done. First, I wanted to point everyone to a wonderful review of Stalking the Beast that popped up at Black Gate. I haven’t been much involved with the magazine site for quite a while, so I had no idea that this review was coming up, or that it had even been planned. Writer Nick Ozment seemed to love the book, which pleases me mightily. Sometimes people don’t like things you write for understandable reasons, and sometimes they don’t like things you write because they apply their own assumptions to it (not being familiar with an unreliable narrator, say, or not knowing the difference between an info dump and an Arabian Nights story-within-a-story ). But sometimes a reviewer finds exactly what you were hoping a reader would take away from your work and then explains it cogently, and that’s what Nick Ozment did. This morning I’m turning my blog over to the talented Suzanne Church. I was first introduced to Suzanne in 2011 at DragonCon by John O’Neill, and found her witty and extremely kind, but I had no idea what a fine writer she was until I attended one of her readings at the 2012 WorldCon. I’ve been a fan ever since and have made sure to attend every single one of her readings at any convention where we’re both in attendance. I went out of my way to track down several anthologies just to have copies of her work, and I’m excited to learn about her new short story collection. Anyway, take it away Suzanne! I remain in the literary salt mines this week, so I’m reprinting an article I wrote for Black Gate back in 2012. When I tell people what a great writer Robert E. Howard was, a lot of them don’t seem to believe me. If they only know him through depictions of Conan or, worse, rip-offs, then they think Howard’s writing is all about a dull guy in a loin cloth fighting monsters and lots of straining bosoms. It’s not that Robert E. Howard thought himself above describing a lithesome waist or a wilting beauty, especially if he needed to make a quick buck, it’s just that there’s a lot more going on in a Conan story than his imitators took away. 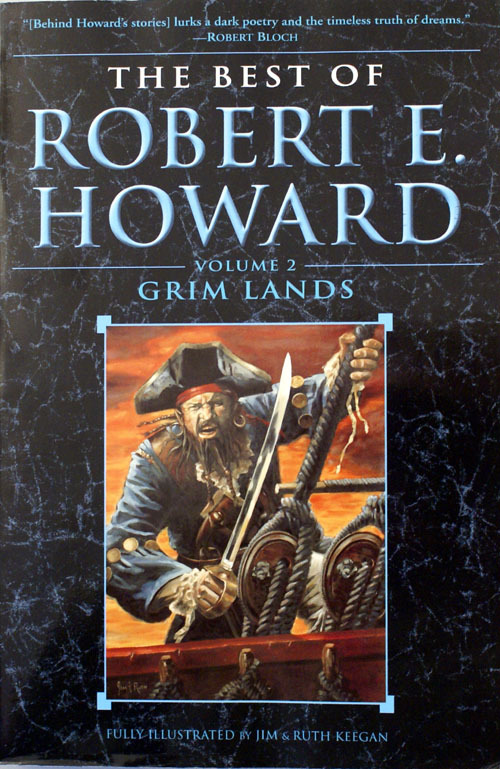 It’s easy to pull some samples of great action writing from Robert E. Howard. I’ve done it before, and I could easily do it again here. Only a handful of writers can approach him in that field, and almost none are his equal. He was also a master of headlong, driving pace. That can be hard to showcase without insisting you read an entire story, so today I want to show readers who seem unaware of his work (or those who are uninterested) a few more reasons why those of us in the know revere him so highly. Here in one of his historical stories, ”Lord of Samarcand,” is the Scotsman, or Frank, as the easterners call any from Europe, Donald MacDeesa, riding to the court of Tamarlane the Great. See how swiftly, how easily, Howard conjures the scene in all its splendor with just a few well-chosen words, as though he’s panning a camera as MacDeesa rides. Howard and Saladin put their heads together. I am crazy busy with book deadlines right now, so there’s apt to be some radio silence. I did want to remind everyone about the Crossing the Streams contest, which is still under way. Bop over there now for a chance to win a free copy of not only a book from me, but scads more authors besides. My Dabir and Asim stories, as well as the historical fiction of Harold Lamb and the fantasy work of Saladin Ahmed, got a call-out along with some fine fiction in a wonderful article on Silk Road Fantasy by Paul Weimer over at SF Signal yesterday. Lastly, I sort of have a new Welcome page that newcomers might have missed. Being so busy with, you know, writing, I haven’t had time to reorganize the site so it’s easier to find. Perhaps I’ll pin it up top eventually. Anyway, it has links to many of my favorite posts, and you can find it here.